Caleb McGuire was just coming into his own when his basketball career at Erskine Academy ended last winter. Over the second half of the season, McGuire averaged double figures in scoring and rebounding. 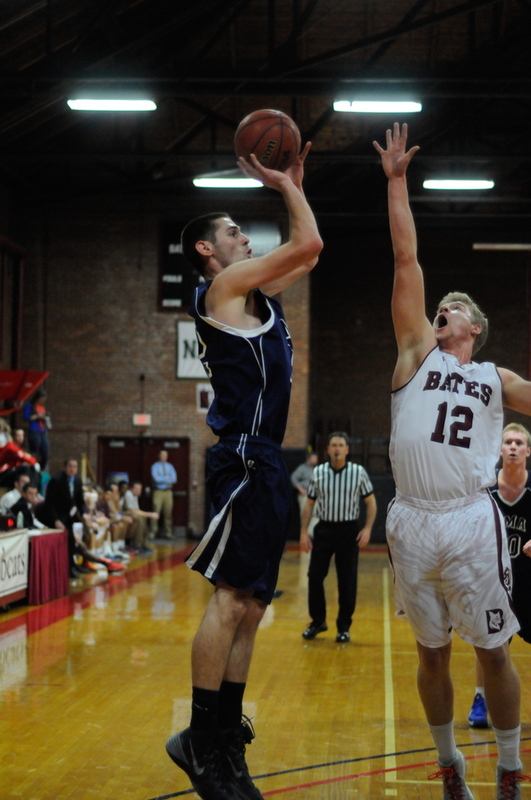 The 6-foot-7 forward has continued that progress this year for the University of Maine at Augusta and displayed a few talents that few knew he possessed. STATS: 9.4 ppg., 3.2 rpg. McGuire played the post most of his time at Erskine and seldom got a chance to display his outside shooting ability. The shot has emerged for the Moose this season where he’s shooting 47 percent overall and 38.1 percent from the three-point line. McGuire has also shown an ability to handle the ball, sometimes bringing it up the floor. He’s still adjusting to the physicality of the college game, though. He was matched up against a 6-foot-10, 250-pound player in the first game for UMA at the New Hampshire Technical Institute tournament. He’s been pushed around a little as he learns the physical aspects of the college game and has frequently found himself in foul trouble. Ford saw McGuire play a number of times in high school, often while watching his son Sean play against him at Edward Little. He liked the progress he saw from McGuire’s junior to senior year and expects more of the same from this season to next. McGuire called his decision to attend UMA a no-brainer. Basketball figured into his decision, too. But it’s been a struggle so far for the Moose, who have played strong competition like Husson, Bates and the University of Maine at Farmington with undermanned squads. They began the season with 15 players, then went to 11, 7 and at one time just five players. In weekend losses in Vermont, the Moose played with just seven players. That hasn’t diminished McGuire’s enthusiasm. Ford hopes to expand his roster during the second semester, and his enthusiasm at this point is directed toward his regulars, led by McGuire, Brandon Rogers and Keith Chesley. McGuire averaged 9.4 points and 3.2 rebounds a game and would like to improve on both those numbers. “I’d like to get better rebounding and get better in the paint,” he said. McGuire is majoring in business administration and said he’d like to open his own business some day. He’s already made a lot of friends on and off the team and has no plans to transfer. “I’d like to stay at UMA,” he said.